Anyone with a low thyroid function knows that losing weight feels nearly impossible. Some of us try starving, some of us are exercising excessively despite a distressing lack of progress, and some of us have simply given up. Before I was diagnosed as Hypothyroid, I was doing all of the above. The thyroid gland produces hormones that ultimately control a person’s metabolism, which is the way in which the body burns calories to provide cellular energy. When our thyroid hormone levels are low, calories are not burned effectively, resulting in weight gain even when very few calories are consumed. You might feel as though everyone around you eats normally, without consequence, whereas you eat very little and yet continue to gain weight. Water retention also tends to be high. Ideally, treatment with thyroid hormone increases an individual’s metabolic rate, thereby increasing the amount of calories that are burned which results in weight loss. In most cases, however, treatment with thyroid hormone alone cannot entirely correct metabolic problems and relieve symptoms. Simultaneous nutritional therapy is essential to maximize weight reduction and eliminate many of the troublesome symptoms that plague people with low thyroid function. Low thyroid function frequently occurs when the body becomes “allergic” to its own thyroid gland. The confused immune system forms antibodies against its own normal thyroid tissue, killing off the thyroid-hormone-producing cells, resulting in low thyroid function. This situation is called autoimmune or Hashimoto’s thyroiditis. Antithyroid antibodies rarely disappear, but with life-long treatment via a combination of thyroid medication and dietary modifications, symptomatic relief and the maintenance of a healthy body weight can be achieved. If ever a person has been challenged with weight gain, it is someone suffering from an underactive thyroid. Prior to being diagnosed, I observed my own weight creep up slowly but surely, despite strict adherence (I am a nutritionist after all) to what I believed would be a fat-reducing diet. Frustrated, I consulted with two doctors who wanted to prescribe antidepressants, despite my insistence that my “wanting to sleep all day” wasn’t a euphemism for wanting to commit suicide. Finally, I was diagnosed as hypothyroid by an endocrinologist and put on Synthroid. When asked how to manage weight gain, I was told to “start eating like a woman”. By that she meant eat no more than 800 calories a day and to drink my coffee black. I wasn’t going to do that, and neither should you, as it is unhealthy and potentially dangerous. As a nutritionist, I know (and everyone knows) that 800 calories a day is not sustainable (although I do have a number of overweight hypothyroid clients who eat less than this). That was not a path I was willing to take. I am willing to work harder and eat cleaner than those who do not have a thyroid issue, but I am also a confirmed foodie, and I wanted to eat proper meals. There had to be a better way. So, how to lose weight when Hypo. Warning: It will be slow. It took me 20 months to lose 20 lbs, but the alternative was 20 more. A year and a half later – I’m glad I never gave up. Losing weight this slowly can, with the normal fluctuations that occur during weight loss, (especially if you are a pre-menopausal woman) make it appear that no progress at all is being made after a month or two. It’s crucial to watch the trend, not the actual number and as I tell my clients: to chase the low. What I mean by that is: keep looking for the next new low (no matter the fluctuations in between, and no matter how small they might be). Watch your insulin: Losing weight has far less to do with watching calories than it does with watching insulin. Insulin, a hormone just like T4, T3, melatonin, testosterone or estrogen, is the hormone used to lower blood sugar, and store body fat. If Insulin is the bear, when the bear is poked (by eating carbs, i.e., sugar), we gain weight. In the absence of insulin, we lose, even if calories are high. This is why cutting calories does nothing, if the calories that remain are poking the bear. Don’t poke the bear! Be patient and tireless in your quest to find the right medication for you. I was put on Synthroid, then Armour, then Synthroid and Armour, then Nature Throid, then generic T3, then generic T3 and Armour, then Cytomel. I am now on a T3 only protocol. I’m not the only one. Find a doctor who is willing to keep working with you. It took me two years to find the right medication and dosage thanks to an amazing doctor who never gave up on me. Eliminate Gluten. Even if you don’t have Hashimoto’s. Even if you have “no adverse reactions”. Eliminate gluten. There are no universal rules except this one. We burn a greater percentage from fat when we sleep than during any other time of the day (including when we exercise), so skimping on sleep will thwart your weight loss efforts. If you are having trouble sleeping, talk to a doctor or nutritionist for tips on how to get or stay asleep. Lift weights, but don’t do excessive cardio. One of the ways we lose weight when Hypo is by losing lean mass (muscle mass) which is not a good thing. This is due to two things: 1) we are exhausted, and therefore moving and lifting less and 2) some medications (such as t3) are catabolic, meaning they break down both fat and muscle indiscriminately. Weight lifters who take t3 to cut fat also take steroids to preserve muscle (this is a very bad idea!). It’s essential to preserve and indeed gain lean mass while trying to lose body fat, as our lean mass supports our metabolism. Excessive cardio can actually make it harder to lose weight. Lift weights over running. Have your Iron, D3, Selenium, B12, Ferritin, Folate, DHEA, Estrogen, Progesterone (including men) and testosterone (including women) tested. Make sure they are optimized and not merely “in range”. Find a doctor who will treat your symptoms, and who examines your bloodwork only within the context of these symptoms. Before I met my current doctor, I saw doctors who would ONLY prescribe Synthroid and told me the weight gain was age related (I was 39). If your doctor only talks about your TSH, run. TSH testing is outdated and much too broad, and yet some doctors will ONLY test this hormone. You need a complete panel: Total and free T3 and T4, TPO and Tg thyroid antibodies, T3 uptake and reverse T3. If they are “in range” and you still have symptoms, you need to further adjust your medication. Don’t believe that you have to eat 1000 calories a day or less to lose weight. If you are properly medicated, this is simply not true. Be fanatical when it comes to grass fed meat, wild fish, pasture raised (NOT free range) eggs and organic dairy. The hormones and antibiotics used in conventional farming and dairy get passed along to us. Thyroid hormones are hormones, and are affected by such practices. Don’t drink too much alcohol. Alcohol is sugar. Sugar triggers insulin. Remember the bear. Never assume that the Paleo, Keto, Vegan, EatStrong Plan a friend is following will work for you. Just because a friend feels great on Synthroid and eats gluten, don’t assume it will work for you, even if you are similar in every other way. Most of us need a personalized approach to medication and nutrition. Regardless of the plan you choose to follow, stick to this rule, and you WILL LOSE WEIGHT: Eat more fat, more protein, and less carbohydrate. Dietary cholesterol has a 0% impact on blood cholesterol. Saturated fat has no impact on heart disease. Sugar (carbohydrates) affect both cholesterol and heart disease. Eat more fat, and more protein. Bacon and eggs for breakfast, burgers with avocado for dinner! When including carbs (but try not to do so) focus on Round-Up-free (organic) veggies, sweet potatoes, and oatmeal. Avoid fruit if you are trying to lose weight. I know. Am I crazy? But fruit is so healthy! Yes, it is, if you don’t have weight to lose. But fruit triggers insulin just as does a cupcake. It has exactly the same effect on your insulin as a pack of gummy bears, so while full of healthy vitamins and antioxidants, don’t think you can lose weight if you are eating fruit. You can have plenty of fruit once you reach your goal. I gave it up for two years and eat it every day now. Everyone fights this concept, and I know it’s hard, but you will be having fruit again soon. The exceptions to this rule are avocadoes and olives. You may have both. Speaking of avocados, eat one every day. Or two. Remember – we aren’t counting calories. A burger or two topped with avocado and bacon makes a great dinner. Do not believe that you are destined to be heavy, are the exception to the rule, “can’t lose weight”, or are too old, too female, or too tired to lose weight. Everyone can lose, including you. If you feel you need support, enlist the help of a competent nutritionist with whom you feel connected, until you have the confidence to work alone. 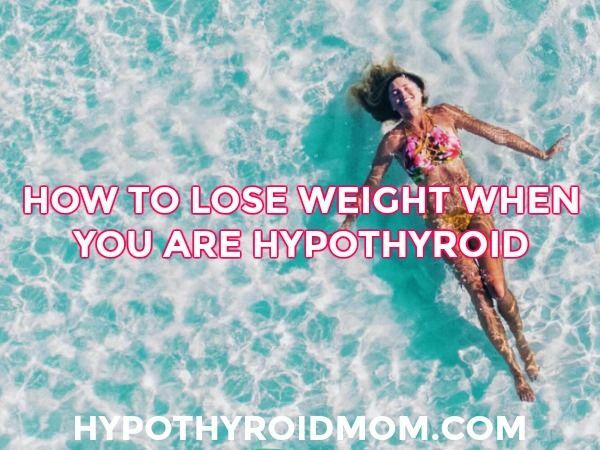 Losing weight when hypo is undeniably harder than is losing weight with a perfectly functioning thyroid. Yet so many things that are hard are worthwhile. Try to view the journey as something exciting, a tremendous challenge, which you will be proud to overcome. Try not to dread the process. You will NOT be hungry on the right plan. Losing weight will give you a profound sense of accomplishment, and you are worth the effort. Sophie Anson is the Founder of Eatstrong, a multifaceted wellness company in New York City that has helped hundreds of people achieve their personal goals in terms of weight, fitness, health and overall wellbeing. Originally from Switzerland, Sophie came to the US in 1992 to attend Hamilton College, where she earned a bachelor’s degree in psychology. Struggling with her own weight, she later obtained her American Council of Exercise certification as a nutritionist. Dr. Hugh D. Melnick, MD, is a reproductive endocrinologist who has been treating patients with hormonal and fertility problems in NYC since 1976. He began to notice the number of infertile women visiting his offie who were symptomatically hypothyroid. They would go on to finally conceive after treatment with thyroid medication. Dr. Melnick’s vast clinical experience together with his own personal experience having hypothyroidism himself has enabled him to develop a unique approach to the diagnosis and treatment of hypothyroidism. In addition to his fertility services, he works with women and men with hypothyroidism at mythyroidmd.com. I’m so glad I stumbled upon this article. I feel so alone, wish there was a support group for hypothyroidism. I’ve gained so much weight and couldn’t understand. I go to the gym but I’m only doing cardio. So now I know to limit the cardio and start weight training. I’m taking Synthroid and not really sure how I feel about it. When first diagnosed I was on armour and it seemed to be fine but then something happened and was switched to naturethroid and ultimately changed to Levothyroxine. I was having so much pain on levo and learned from a co worker that it’s filled with fillers to have dr change to synthroid. I felt the difference, but still experiencing pain at times. I feel helpless. My husband thinks I just eat and that’s the weight gain but I really don’t eat a lot but I can say I eat the wrong things. Plan to cut sugar and increase protein and fat and see what happens. I have had hashimotos and then something got worse 4 years back. I thought I might be dying I was suddenly sooo tired, could barely get up stairs or an incline. Felt like I went from 43 to 90 years old over night. Now on naturethroid which does me better than synthroid but still not right. I have to take a nap after an easy day at work I am looking for help. I’m now only 46! Been diagnosed with CFS. ENT says I have sjogrens but rheumy disagrees. Endo and Rheumy disagreed on cause of positive ANA. I have to do something so I’m going to try the things here and see what happens. I either need to kick the bucket (note not at all suicidal) or get better. This living is crap. I’m scared to make food changes but here I go. I have always had sleeping problems and all the suggestions do not work for me. I have basically been on this type of food for years and two years ago I lost 40 lbs, but struggled the following year to keep it off. My thyroid doctor was usless and would not listen to my complaints of tired and gaining weight so I have been doing my own thing for awhile. My family doctor believes in “the range” being adequate so I have stopped talking to him about it. All he cares about is cholesteral and he knows I can’t take statins. I am on my own. At 72 I’m gaining weight while recovering from a knee injury a few months ago. I had slowly been loosing weight. Very slow weight loss vs very fast weight gain. It took years to loose 34 pounds. No medication. Tests fall in range but every symptom described fits. Drs aren’t much help. Glad to see weights over cardio. It really worked and fits my life much better. Hi I’ve been on 100mg levothyroxine for 12 years and the dose has never been changed. I only have one blood test a year and I never had any symptoms,the doctor just did a blood test. Can I stop taking these tablets? Thanks for a great post. I’ve been treating my thyroids for 15 years. I haven’t been able to stay in a good weight for long. Every time I think I’ve reach a goal, the weight comes back. In fact last time the weight came back so fast I was shocked. I’ve gained 10lbs in a month and then another 10 until I gained all the weight (40 lbs) back. I have a great doctor who does very in-depth blood work but he switched me to Armour right when I had lost the 40lbs, I think that triggered the weight gain. I have to say the low sugar, high protein and high fat was the only thing that worked for my weight loss and it took several months to loose it. Now I’m working my way back. It’s just frustrating for someone who has always been skinny. Thanks again for your post, it was very informative. In 2010 at 61 years old my thyroid was removed due to malignant nodules. While I had ups and downs over the years I was basically doing well. In January this year my retiring endocrinologist moved me to his associate who lowered my Synthroid dosage after being (feeling) perfectly fine for several years. I have been a Weight Watcher member and lost 30 lbs and was delighted that it was with real food in moderation and regular exercise. However within a month of the new lower dosage my weigh ins started going up with 1/4 to 1/2 lb gains every week, inspite of my established healthy eating and exercise and experiencing other symptoms associated with thyroid levels that are out of whack (not needing to shave legs is a quick indication, headaches, etc). After 9 years of living with this I know when I have issues. New doctor doesn’t want to do labs again for another month (3 months on new dosage). I am beside myself, not sure if I need to look for another dr who will listen to me or just tough it out and try anything to slow the rate of gain. Hi Bonnie, I am right with you on the symptoms. Any suggestions on alternatives? I am on Levothroxine and am experiencing the same. I help direction on an alternate.